A view from the put in at high water. The gravel and block design mean good footing no mater what the water level. The Nashville skyline is changing, with lots of new construction. In the foreground is Ghost Ballet, a sculpture also known to locals as the rollercoaster. Paddling from the put in at Nissan Stadium to the Shelby Bottoms railroad bridge is about 2.75 miles one way, but you can return at any point, making the length completely up to you. The downtown section is a pleasant stretch of wide water which requires little in terms of steering technique, but a potentially robust current and waves from large boat traffic add a mild level of difficulty. This paddle can be done at any time of year, but rainfall and water levels can dramatically affect the speed of the current, occasionally making it too fast for an upstream paddle. If you dog is comfortable on your boat, bring him along! 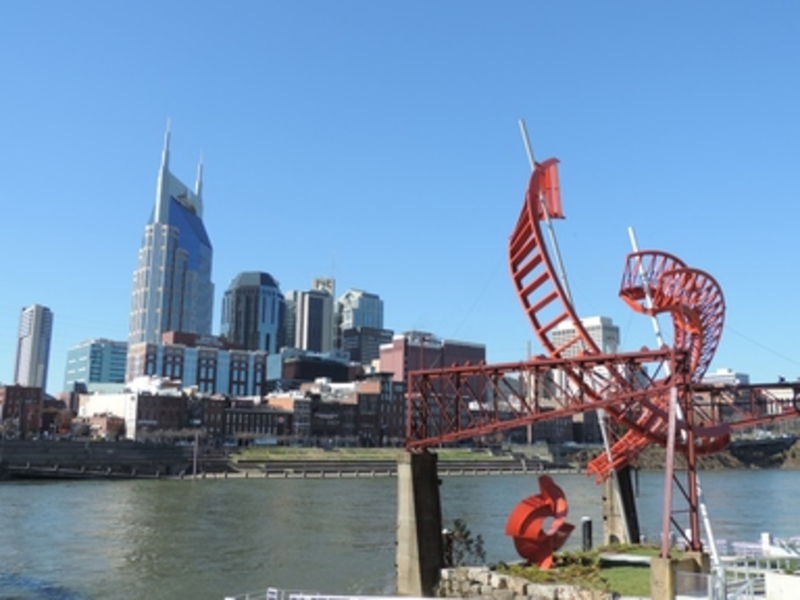 Nashville was built on the Cumberland River connecting the city’s people and products to the outside world. Today, it makes for a picturesque city, and a convenient boating location. With an abundance of area lakes and streams, kayaking on the Cumberland is often overlooked, but it deserves your attention. The river provides the wide vistas of a lake, and the current adds an additional workout for upstream paddlers. 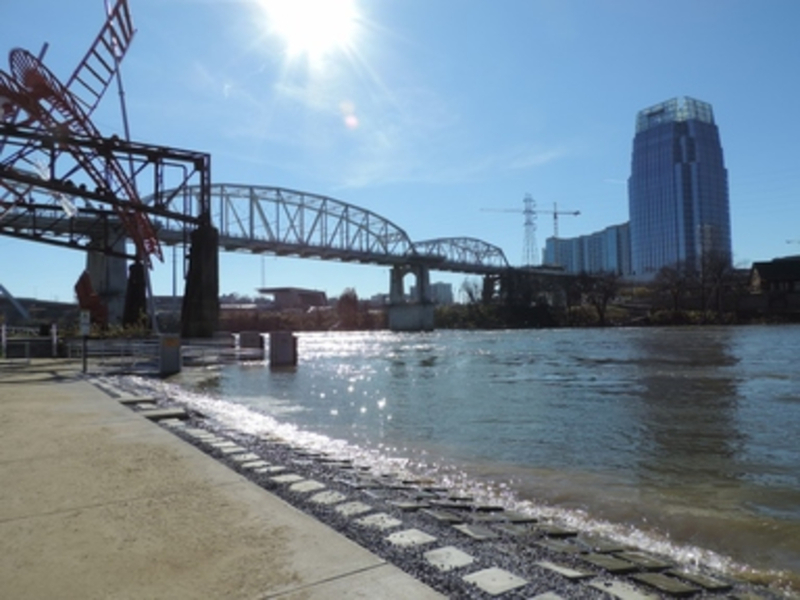 You may share the water with the General Jackson paddle boat or coal barges as you paddle past historic bridges, industrial docks, and the Ascend Amphitheater. The railroad bridge at Shelby Bottoms marks the turnaround point for a 5.5-mile trip. The put-in is directly across from downtown Nashville, and it’s a pretty sight from the water. As you paddle, you will come under the first of four bridges, the 1909 Shelby Street bridge, which became pedestrian in 2003. Just beyond is the much newer Korean Veteran’s Blvd Bridge. As you pass through this section, you may hear music in the air, from Ascend amphitheater, Cumberland Park, or maybe even from Broadway. As you continue upstream, the banks become more wild, with tall trees, turtles and herons, and if you time it right, you might pass the General Jackson Showboat on its way downtown. You’ll also pass some tall boat moorings, and perhaps a barge or two. 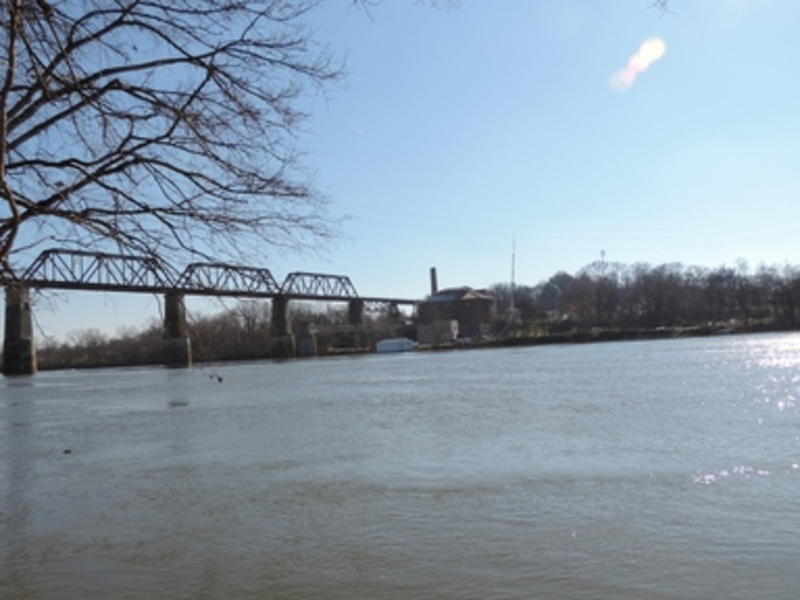 After a gentle curve in the river, and passing under I-24, the railroad bridge will come into view, but it will take a little while to get there. Shortly before reaching it, you will see a boat ramp on your left for Shelby Bottoms, so it is easy for you to get out and have a rest if you like. From the bridge, it’s an easy float back downstream with the current. When you get back downtown, don’t forget to head across the bridge for some barbecue at Jack's or a drink one of Broad's many honky-tonks. This float is perfect if you are looking to get a good workout in, without going far, or if you just want to do some open water, without as many smaller power boats as can be found on the lake. Keep in mind the boats you may encounter are large, and they produce waves to match, but otherwise the trip is a great straight forward paddle that can be as long, and as challenging as you want it to be. Access is from the Titan's Stadium Parking lot (so keep that in mind during football season), just off of Korean Veterans Blvd. There is not a back in boat ramp, but the best place to park and unload your boat is where Victory Avenue turns right and becomes Titan's Way. You'll want to park in Lot R next door. This will save you carrying your boat too far, but it is a little bit of a walk down a grassy hill with your boat to the water's edge.